In February 1847 a group of “Lippers” who were liberal members of a German congregation called “die Berckirch” formed a missionary society known as “Der evangelischen Missions-Verein in Quincy, Illinois.” About Easter, 1848, Rev. Christoph Jung, a member of the mission society founded Salem’s congregation. The first meetings were held in his home at 725 Maine Street and later in the old Congregational Church building on the northwest corner of Jersey and Fifth Streets, the present site of Quincy Herald-Whig. In May 1848 the congregation started their first church building, a brick structure, on the corner of State and Ninth Streets. It was said that the lot was donated by Governor John Wood but courthouse records indicate that the land may have been purchased. The building was 36 feet wide and 48 feet long, faced south and had a modest steeple with one bell. The total cost of materials was about $3,000 and the congregation provided the labor. In 1852 the congregation was officially organized and the first constitution was adopted. In 1863 the building was enlarged when 20 feet were added to the length. In 1875 the congregation decided a larger church was needed and on January 31 of that year the plans for the present building were approved. During the time of construction a special “boards” church was used on the corner of State and Eleventh Streets. The cornerstone was laid in pouring rain on June 25, 1876. The original part of the building is 110 feet long and 55 feet wide with a spire of 237 feet. The building was dedicated on September 23, 1877. The interior contains the magnificent sanctuary with a lower level and a full balcony, the whole seating 1,000 people. In the front is the ornately carved walnut apse, high pulpit and choir. It is reported how members of the congregation worked on the building the women carried bricks in their aprons to the men who carried them up the scaffolding and laid them in place. In 1910 a major redecoration took place. The organ, which had been in the rear of the building was moved to the front and in its place was positioned a large stained glass window. New carpeting was laid and the fresco was painted. 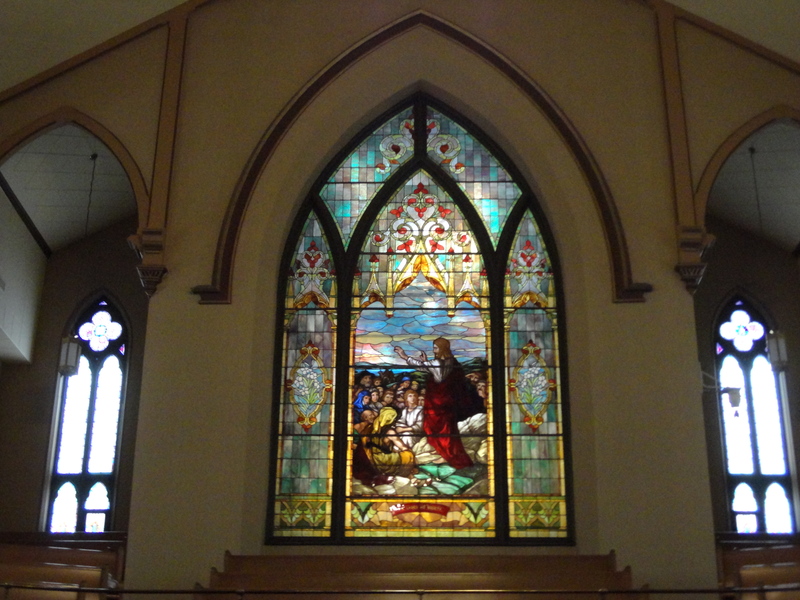 The sanctuary was again redecorated in the early fifties but there are no records available on this work as they were destroyed in the fire that devastated Salem Hall on early Easter Sunday, March 26, 1967. 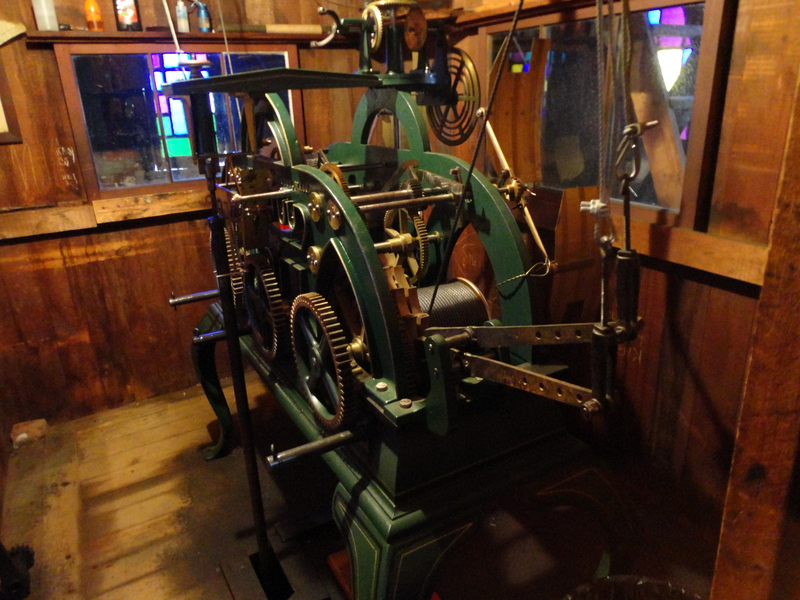 In the tower of the church is a set of three bells named James, Bertha, and Peter. The smallest bell, weighing 1,000 pounds, James, is the original bell taken from the previous building. The second bell, Bertha, weighs 1,500 pounds and the largest of the three, Peter, weighs 3,000 pounds. 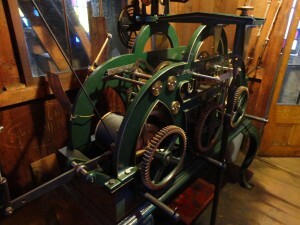 The bells are rung by hand. 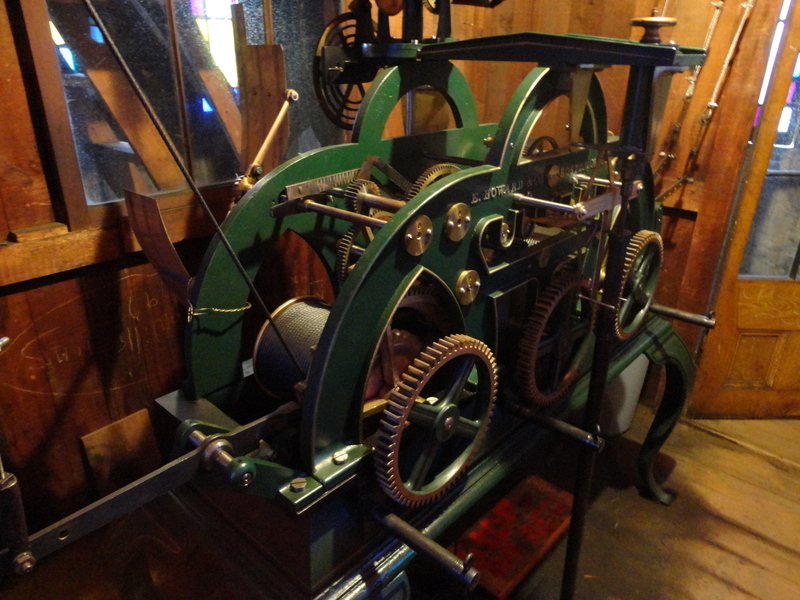 In 1894 the four-faced clock and chime mechanisms was donated by the Bredeweg family. 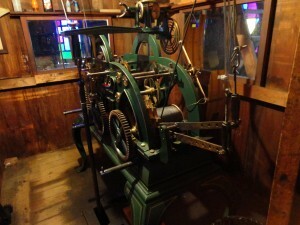 The clock is wound by hand twice each week, the mechanism being 120 steps above the balcony level. Each clock face is six feet in diameter. There are two very historic items in the church today. The Baptismal Font is from the old church and is approximately 125 years old. It was restored in 1952 after having been stored away for many years. 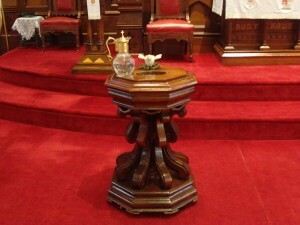 The altar Bible was a gift to the church in 1898 upon the 50th anniversary. It was printed in 1892 and was given by German Kaiser Wilhelm II. 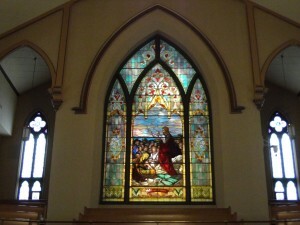 The windows in the church today come from two people. When the organ position was changed in 1910 the space left was filled with the window depicting “The Sermon on the Mount” and the rose window above the organ was installed. The windows along the side were dedicated on February 3, 1952 and replaced the original ones which had become very old and brittle. It is said that when the old glass was removed from the frames it folded like thick cardboard. The organ was built and installed in 1927 by the M.P. Moller Company. It is a four-manual instrument. There are 39 ranks of pipes located behind the choir and in chambers on either side. Most of the pipe work is not visible. This has been replaced with a Schantz two-manual organ of 34 ranks, installed in 2009. For more photos, click on these links.